The UNESCO World Heritage site of Saltaire is four miles from Bradford and is recognised as one of the best preserved 19th century ‘model villages’ in the world. It provides the chance to see just how the woollen industry worked, and it supported a whole community. The leading industrialist Sir Titus Salt founded the picturesque village in 1853, having decided to move his entire business and workforce from Bradford, where he had made his fortune in the wool trade. The site was chosen due to its close proximity to the railway and the Leeds and Liverpool Canal and local architects, Lockwood and Mawson, were commissioned to design the entire village and mill. The terraced housing and local amenities, such as a school, hospital, church, park and institute for recreation and education, provided workers with living conditions in sharp contrast to those found in Bradford’s overcrowded urban centre. When the mill opened in 1853. it was the biggest factory in the world. At its peak, 3,000 workers produced 30,000 yards of cloth a day from 1,200 looms, though, rather sadly, little of this history is on display today. Production at the mill finally ended in the mid 1980s, but it was rescued from dereliction by the entrepreneur Jonathan Silver in 1987. The huge building is home to one of the largest collections of local boy David Hockney’s art, and much of it can be viewed in its two galleries. Work by other artists is also shown in Gallery 2 and a variety of craft and specialist shops, cafes and restaurants can be explored across three floors. Shopping and dining in Saltaire, however, is not just confined to the mill. Boutique and vintage shops, art galleries and cafés can be found on Victoria Road, while more shops, cafés and restaurants can be found a short walk away at Bingley Road. Located at the centre of the village on Victoria Road, groups will find Victoria Hall. The building was opened in 1871 as the Saltaire Club and Institute, and it retains much of its original grandeur and unique architectural features. Intended as a centre of recreation, culture and learning, it still fulfils the same function today and offers five stunning rooms for cultural activity. The Hall is also home to the Reed Organ & Harmonium Museum, which boasts a comprehensive collection of large and small instruments. Close to the mill, in Roberts Park, groups will find one of the finest buildings in Saltaire. The Grade I-listed Saltaire United Reformed Church was completed in 1859 and is a wonderful example of Italiante religious architecture. The church contains the remains of Sir Titus Salt and features Corinthian columns, ornate chandeliers and an organ dating back to 1890. The church also houses a shop, exhibition and small café. 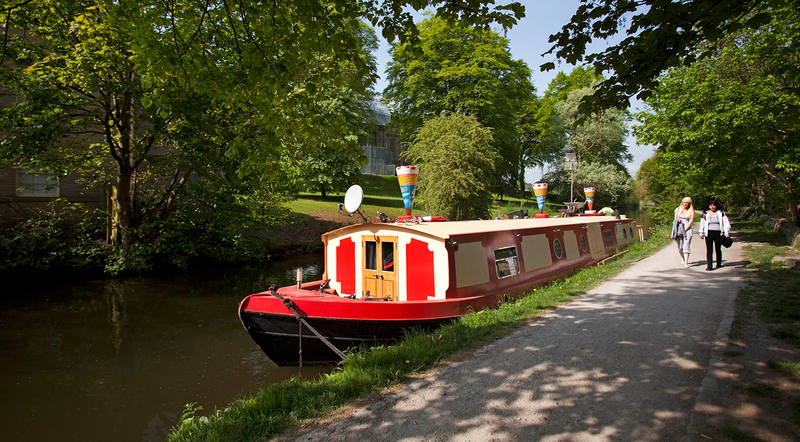 During summer months, visitors can relax by the banks of the Leeds and Liverpool Canal, which runs next to Roberts Park. There are excellent towpaths along the canal and groups can even book a circular boat trip in a narrowboat, offered by Dream Achievers. It is worth taking time to wander around Saltaire to appreciate its carefully planned layout and wonderful architecture, which is largely unchanged from Victorian times. To make the most of a visit and learn about the history of the village, groups could choose to take a walking tour with Salts Walks. Knowledgeable guides lead the informative tours and group bookings are available at any time during the day.